It is the beginning of the Christmas season, and now it is definitely time to get crafting for the holidays season! I started two weeks ago with patterns of my own, or ones I found online. 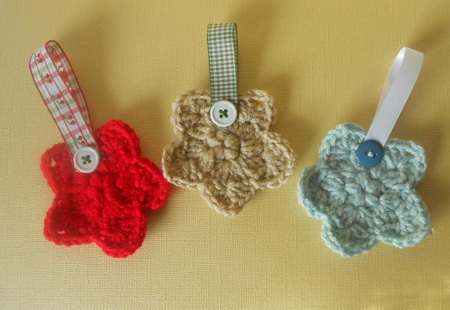 The last one I tried is a star ornament by Kathleen, from One Little Bird Blog. The pattern is easy to follow, with step by steps photos. 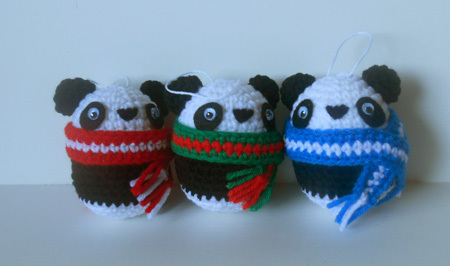 I have started to make Christmas ornaments and decorations, and I wanted to share with you two patterns I found online to make panda ornaments and Christmas trees. First, the panda. the pattern is by Stephanie, from All About Ami, and is very easy to follow. It also includes a koala, and a teddy bear, but I have only made the panda. Her pattern calls for lightweight yarn (3), and a 2.00 crochet hook. Since I had neither, I used a medium/4 yarn and a 2.75mm hook, and modified the pattern by only increasing up to row 5. They are just so cute! 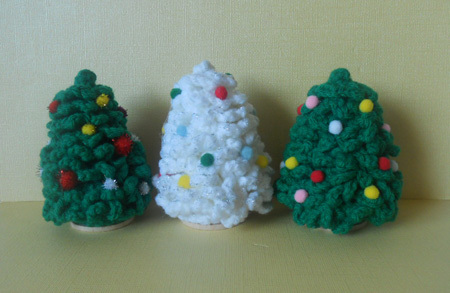 The second pattern is a Christmas tree, and I absolutely love this pattern by The Lazy Hobbyhopper. Not only the pine tree is very cute, the pattern is easy to follow and fun. I made several of them in white and green. I put glitter on the white, and pom-poms on all of them. I glued a little wood stand at the bottom of the trees, I think they look lovely. I really recommend these two patterns if you are looking for Christmas projects, they are fun and easy to make.